Where's the future we were promised? What do we want? Flying cars! When do we want them? At some point, please. 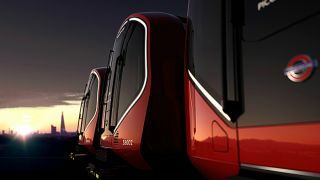 Transport for London showed off its new underground train designs for some tube lines this week, telling us that the air conditioned carriages will be coming into service around 400 weeks from now in the year 2022. Everyone's happy because Wi-Fi is on the spec sheet, that's how boring we've become as a nation. As long as there's something to pacify everyone, and everyone can play rubbish games and swap photos of the shoes of the person opposite, we're happy. It is a little exciting to see some new trains on the drawing board for London, but then again we've had trains for over a century and they're not really doing the job any more. 2022 is quite far in the future too, and although it'll be nice for those in the right bits of London to enjoy 25% more capacity and onboard Wi-Fi (which will be faster than people in rural spots get in their homes), it's hardly a sign that the UK is about to become a radical transport nirvana. One city will have some slightly better trains. We won't have aerial bike lanes, still won't have more than 67 miles of high speed rail line, self-driving cars and anything thrilling won't be allowed. All we've got is the promise of a bit more capacity and, if the unions don't revolt, the possibility of driverless trains. So even in the unprecedentedly futuristic year of 2021, the driverless Docklands Light Railway, opened in 1987 and offering the chance to "be" the driver if you stand in the right spot, will be the most futuristic form of transport London will have. We're still using stuff the Victorians built, which is ironic, as if the Victorians were stuck with a transport system as overloaded as ours you know they'd plough up as much of the city as required to make something new. And they'd do it overnight. Listed buildings would be mulched to provide gravel for the foundations of London's hyperloop (completed in 1982) were the Victorian overlords still in power. Or perhaps they'd have diverted the Thames 20 miles south to use the riverbed as a new bicycle route through the centre of town (completed in 1986 and extended to Penzance in 1992). A few thousand people would die in the process, yes, but their bodies would form valuable historical records in the concrete layer that would leave a picture of today's people for future generations. Not only that, but the air authorities have kicked out Boris Johnson's idea of a hub airport out in the Thames estuary, meaning that we're only likely to see the boring option of a new runway at Heathrow or Gatwick within the next few decades. Political posturing aside, it's disappointing that all we have are promises of slightly better trains, another runway and, maybe, roads that are a bit wider in our transportation future. Where are the bonkers ideas? The electric stuff? The pods? The conveyors and pipes and drones and robot cabs? If we can't afford to take risks, surely some of the overseas money flooding into London could be encouraged to go toward doing something other than laying down tarmac and finding ingenious new ways of shoving yet more people down the tube? And those new trains without carriage doors... How are you going to escape the drunken lunatic when you can't discreetly get off and change carriages at a station?